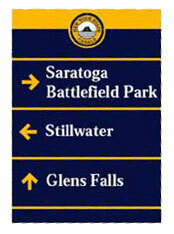 The Signage Design Guidelines were developed for use on canal waterfront and trail projects and in canal communities. As we strive to transform the Canal System into a world class recreation and tourist destination, it is critical that the design guidelines be used systemwide. These guidelines will help establish a consistent and high-quality visitor environment along the entire length of the Canal System. Each of the many products and tools provided herein has a prescribed use and function. It is important to the success of this program to adhere to all specifications. The Signage Design Guidelines are currently being updated, for more information please contact John Dimura at 518-436-3034.